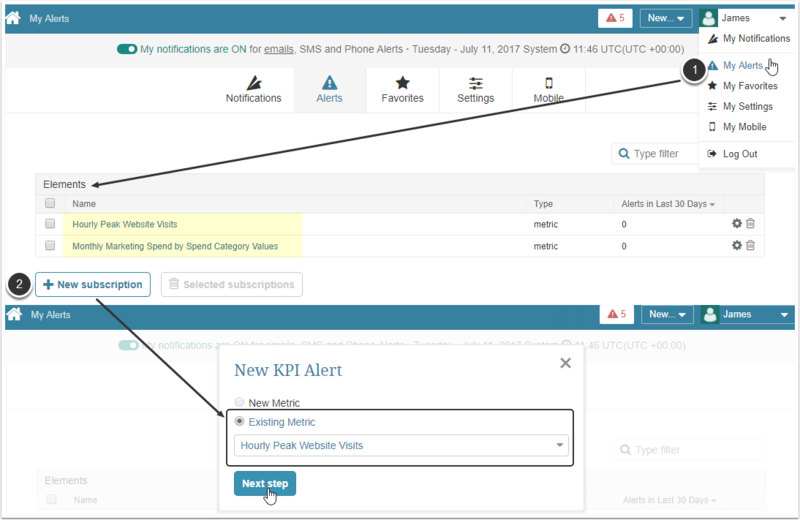 Permissions: Regular Users can create KPI alerts on any Metrics they can view if they have the following Privilege assigned to them either individually or via a Group membership: Create Custom Alert. Admin Users can assigning this Privilege at: Admin > Users > User Editor > Info tab > Privileges section. to a fixed value: For example, Alert me if a Value collected today is more or equal to 1.000.
to a prior value: compare the latest measurement value to a prior value for the same Metric. to an average of prior values: compare the latest measurement value to the average of values recorded recently. to the recent volatility levels: compare the latest measurement value to the standard deviation of the average of values recorded recently. combination of multiple alerts: Mix and match the previously created Alert Rules. Regular users can subscribe to any public (meaning, available to all system users) Alert Rules for this Metric. All they have to do is check the box next to the Alert Rule condition and choose their own preferred distribution method. Alternative way for creating a KPI Alert Rule. How to check what KPI Alerts a Regular user is subscribed to? To check out the list of KPI Alert Rules a User is subscribed to, go to: My Preferences > My Alerts. The list of Metrics to which these KPI rules have been applied is shown. 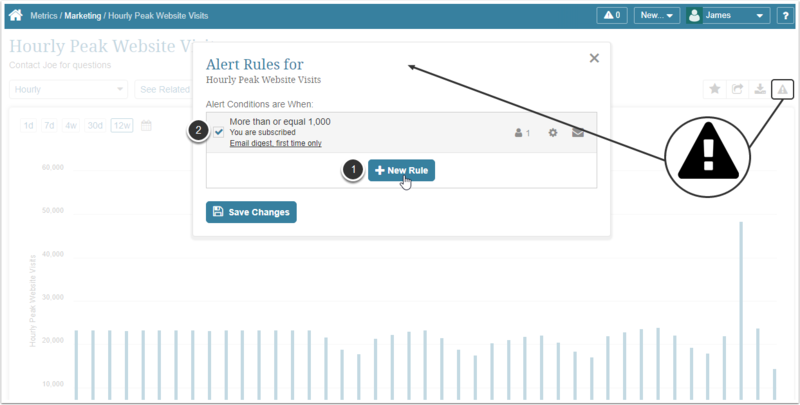 Click a Metric name to access its Viewer and review all the Alert Rules applied to it. To create a new Rule from this screen, click [+ New subscription] to begin. 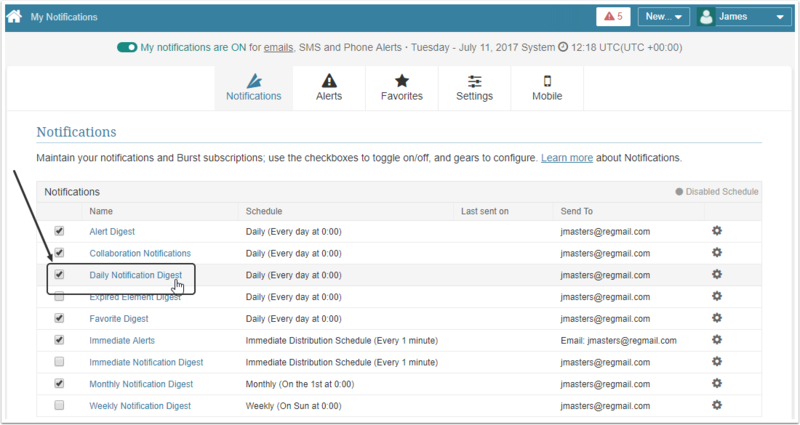 Permissions: Regular Users can subscribe to a Report Notification (Immediate / Daily / Weekly / Monthly Digest) without any Privileges. Metric-based Alert Rules cannot be created by Regular Users. Immediately via email: a user is going to receive an email only in case the Report consists of at least one new row after an update. If there are no new rows, an email will not be sent. NOTE: Distribution schedules for these Digests are defined globally and cannot be changed according to personal User Preferences. For example, if a Daily Notification Digest is set up to be sent "Daily (Every day at 0:00)" by the Admin, every User subscribed to it is going to receive it at the same time. But the content of such Email digest is going to vary depending on User's subscriptions to Reports and his scope of element access. Email address and email Template can be set up by clicking the Gear icon in the respective row. Permissions: Can be created by Admin users only, but when created are available for subscription for any system User (including Regular Users). Global Alert Rules are always labeled in a way so that it is easy to distinguish them from KPI Alert Rules. Such Alerts are applied across a broad range of Metrics. For more details refer to: [Global Alert Rules] How do they work for Metrics? Prev: Why are some of my Favorites folder elements not included in the Favorites Digest ?